SoloDomini Review 2019: Is SoloDomini a Good Hosting? Established in 1999, SoloDomini is an Italian hosting provider offering Linux and Windows web hosting services. This vendor uses high-end Dell and HP servers that are monitored, updated, and optimized to guarantee that all their hosted websites have robust performance. SoloDomini is a web hosting vendor based in Italy. Established in 1999, this company has a customer base of at least 85,000 and is ideal for small and medium-sized businesses. SoloDomini offers a variety of hosting and domain services such as domain name registration, DNS management, domain transfer, and domain exchange. The vendor uses Dell and HP servers that are monitored, updated, and optimized to guarantee that all the websites they host provide robust performance. The company says that when technical problems arise, their staff intervene promptly. Their servers also have redundant hardware components designed to avoid frequent shutdowns. The SoloDomini website is extremely unappealing, not at all user-friendly, and navigating is a big hassle. While it first appears to be available in both Italian and English, the link to the English version of the website is actually a link to an on-the-fly translation by Google Translate. SoloDomini’s prices are listed in euros and they offer just one billing cycle by annual subscription. Although this vendor’s prices may seem pocket-friendly at first, their cheap plans have very limited features, thus forcing users to upgrade to their more expensive packages. SoloDomini has no money-back policy and no uptime guarantee. The biggest issue with this vendor seems to be the renewal of hosting plans. A notable number of customers have suffered from failed reactivation of their hosting plans (even on auto-renew) when they have forgotten to send a receipt of payment to the vendor. It is quite apparent that the vendor’s auto-renewal system has a problem, and some customers have reported renewal issues remaining unresolved for more than a month. You can reach the SoloDomini support team via telephone, SMS, email, or live chat, but the company has no support ticket system. While they offer 24/7 customer support, many customers find it hard to get in touch with the technical support team, and my experience was no different. I sent several emails, called them many times, and when they did finally respond, they came across as somewhat arrogant and incompetent. They do not have a knowledge base, but they do have a ‘community’ link that leads to what looks like their live chat. SoloDomini’s most offputting issues are their problematic renewal system and their hard-to-reach, apparently unhelpful support team. If the vendor can find a way to solve these big customer concerns, it could gain a better foothold in Italy’s web hosting space. 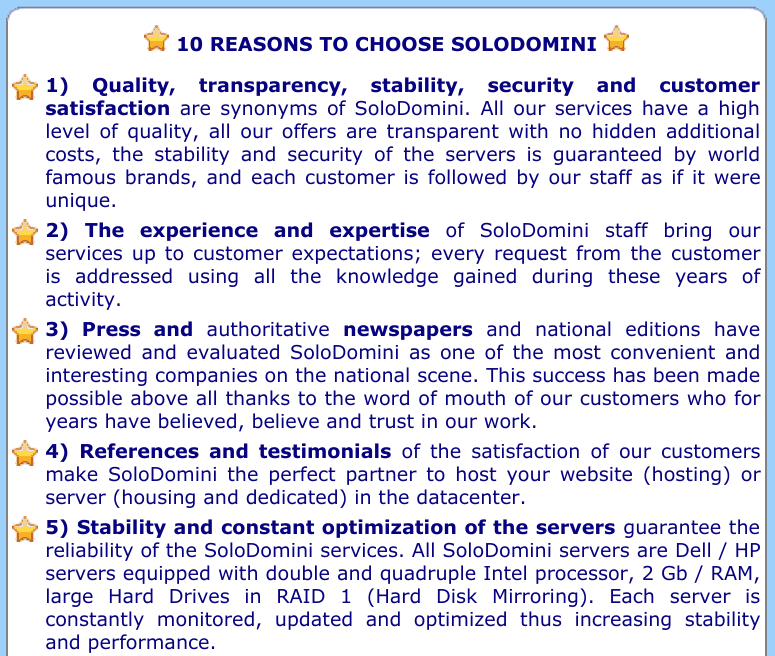 Wondering how SoloDomini stacks up against other Web Hosting companies? Enter any other Web Hosting company and we will give you a side-by-side comparison.